The fuel economy of the U.S. vehicle fleet continues to increase at a record-breaking pace in 2013 ‚Äì and U.S. automakers are laying plans for continued improvements which will reduce fuel consumption by billions of gallons over the next five years. 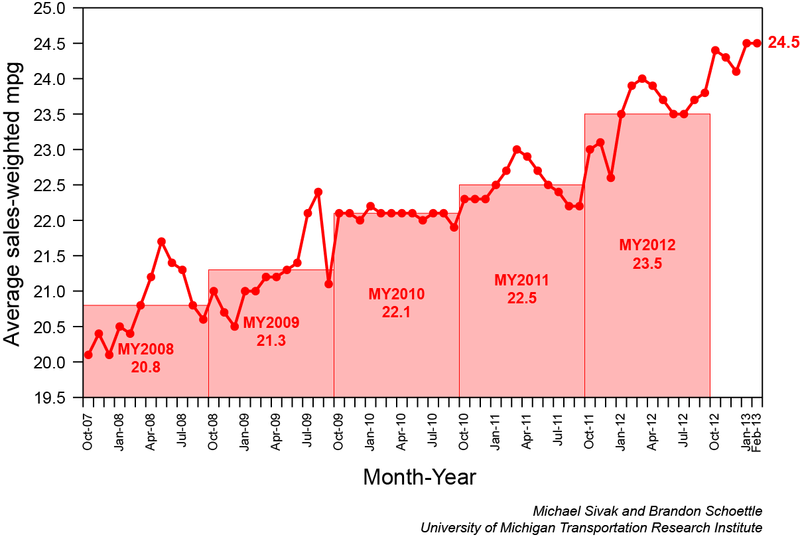 Michael Sivak and Brandon Schoettle from The University of Michigan Transportation Research Institute (UMTRI) reportoverall fuel economy of 24.5 mpg in February 2013. That’s equal to January’s figure for the highest MPG ever recorded since UMTRI began tracking sales-weighted data in October of 2007. WardsAuto.com, using a slightly different methodology, pegs the U.S. fleet at 24.1 mpg in February ‚Äì again, the highest figure recorded since the publication established its Fuel Economy Index in the fourth quarter of 2007. No shift to small cars: The increase in fuel efficiency is not being driven by a shift to small car purchases, says automotive forecaster Alan Baum, principal at Baum and Associates. “Trucks are gaining share, both in terms of pick-ups and large crossovers, small cars are losing share, and the improvement in fuel economy is still happening,” Baum told DrivingGrowth.org. Akerson Lays Out Fuel-Saving Agenda: The change in how the auto industry is using its brain power was on display in Houston earlier this month when General Motors CEO Dan Akerson spoke at the CERAWeek conference. The annual gathering, featuring high-powered industry and government officials, is sponsored by Cambridge Energy Research Associates, the energy consulting firm founded by author and analyst Daniel Yergin. Light duty vehicles account for some 60 percent of U.S. energy use in the transportation sector, said Akerson, which puts the auto industry front and center in discussions about reducing energy use and U.S. oil consumption. Reduced vehicle mass. “A good rule of thumb is that a ten percent reduction in curb weight will reduce fuel consumption by about 6.5 percent,” Akerson said. The company is aiming for a 15 percent reduction, investing in high-strength steels, carbon fiber, aluminum and other advanced materials. Improvements in internal combustion engines (ICEs), including “turbocharging, direct injection, variable valve timing and cylinder deactivation.” GM also plans to introduce more vehicles driven by clean diesel engines. Electrification, including pure electrics such as the Chevy Spark, EVs paired with gas engines, like the Chevy Volt and Cadillac ELR, and eAssist, a light electrification technology used to improve fuel economy in ICE vehicles such as the Buick LaCrosse. The company expects to have “500,000 vehicles on the road with some form of electrification” by 2017. The fuel-saving strategies pursued by North America’s largest automaker, said Akerson, will have a significant near-term impact on U.S. fuel consumption. GM currently has about 18 percent of the U.S. light vehicle market. As other manufacturers work to meet federal standards ‚Äì and stay competitive in a marketplace where fuel economy is a top priority for consumers ‚Äì the overall reduction in U.S. fuel consumption is expected to be several multiples of the 675 million barrels targeted by GM.